Chronic suppurative otitis media (CSOM) can cause a wide range of pathologies in the middle ear that include irreversible mucosal changes, granulation tissue formation, cholesteatoma, tympanosclerosis, and ossicular destruction. CSOM with or without cholesteatoma may lead to ossicular discontinuity. However, this can only be confirmed per operatively by checking for osssicular continuity by means of round window reflex etc., A high resolution computed tomography scan of temporal bone is a preoperative tool that can be used to assess the status of the ossicular chain; however, its cost factor limits it use to CSOM of atticoantral type with complication or impending complication. There was a strong opposition and fear toward ossicular reconstruction during the early 19 th century, which can be attributed to lack of microscope and microsurgical instruments. There were no audiometers in existence, which could measure improvements in hearing after surgery. Reconstructive surgery was revived by Holmgren, who introduced the use of binocular microscope in ear surgeries and started treating otosclerosis surgically. With the advent of silicon sheets and bioimplants, reconstruction of the conductive apparatus has become a rule rather than an exception in middle ear surgeries. In this scenario, preoperative information about ossicular status becomes important as the surgeon can be prepared for performing ossiculoplasty well in advance. Also, patients can be informed of the realistic estimate of hearing improvement after surgery. There are very few reports in the literature explicitly describing the relationship between preoperative findings and ossicular discontinuity as there is considerable ambiguity with respect to the reliability of the preoperative parameters. 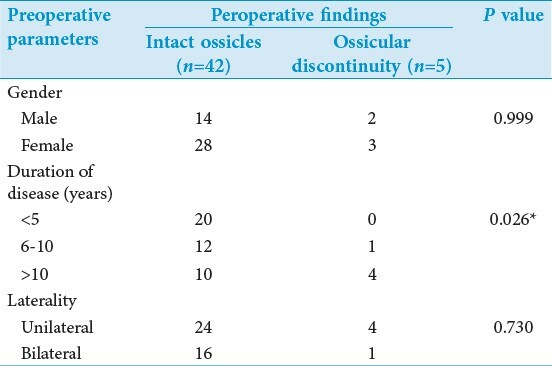 This study attempts to identify the relationship between different preoperative parameters and ossicular defects that could only be observed during surgery. This is a prospective study conducted after obtaining clearance from institutional ethical committee. The study included a total of 47 patients diagnosed to have tubotympanic type of CSOM. Inclusion criteria were patients in the age group of 10-50 years having unilateral or bilateral ear disease. Patients having congenital ossicular defects, traumatic ossicular defects, and those with previous history of otologic surgery were excluded from the study. The patients were explained about the study and written informed consent was taken. Initial patient evaluation included detailed history, otomicroscopic examination, pure tone audiometry, and X-ray mastoid lateral oblique view. Certain preoperative parameters that might have association with ossicular destruction like gender, age, side of disease, duration of disease, size of perforation, presence of persistent ear discharge, margin of perforation being adherent to promontory, myringosclerosis, polypoidal middle ear mucosa, granulation tissue in the middle ear, pure tone average (PTA), Air-bone gap (ABG) and mastoid pneumatization were recorded. Audiometry was performed in a sound proof room using Elcon EDA-3N3 MULTI audiometer. The PTA was calculated by taking the average of hearing thresholds at 500, 1000, and 2000 Hz. All patients underwent surgery as per the requirement of the condition and institutional norms. The ossicular status was documented at the time of surgery. A patient with partial or complete loss of any ossicle, found during surgery, was considered to of having satisfied the criteria of ossicular discontinuity. Data were analyzed using EPI Info 6 Software. Chi-square test and Fisher's exact test are the test of significance for association of categorical values. Paired t test was the test of significance for continuous variables. P < 0.05 was considered as statistically significant. The study comprised of 47 patients, 16 (34%) males and 31 (66%) females. A total of 42 (89%) patients had intact ossicles and 5 (11%) patients had ossicular discontinuity. There was no statistically significant difference between males and females with respect to ossicular discontinuity (P = 0.99). Age distribution showed maximum number of patients within the age group of 10-30 years. In the study, it was observed that duration of the disease was <5 years in the majority, that is, 20 (42.5%). A total of 13 patients (28%) had disease for 6-10 years, while 14 patients (30%) had disease for more than 10 years. Among five patients who had ossicular defects, four had duration of the disease for more than 10 years. There was a positive correlation between duration of disease and ossicular defects, which was statistically significant (P = 0.026). Within the study group, 28 (60%) patients had unilateral disease, while 17 (40%) had bilateral disease. A total of four patients with unilateral disease (14.2%) and one patient (5.88%) with bilateral disease had ossicular discontinuity which was not statistically significant (P = 0.73). On evaluation of the perforation, 36 patients (76.5%) had a central perforation (including small, medium, and large central perforations), while 11 (22.5%) patients had a subtotal perforation. Among five patients with ossicular defects, two (40%) had central perforation, while three (60%) had subtotal perforation. There was no statistically significant association between the type of perforation and ossicular defects (P = 0.151). Among the 15 patients who had dry ear, none had ossicular discontinuity, whereas 5 among 32 patients (15.63%) with persistently discharging ears had ossicular defects (P = 0.266). Margin of the perforation was adhered to the promontory in eight patients, four among them had an ossicular discontunity. Among the other 39 patients, only 1 had ossicular discontinuity. There was highly significant correlation between adherence of margins to promontory and ossicular discontinuity (P = 0.003). The other otomicroscopic findings like myringosclerosis (P = 0.99), polypoid middle ear mucosa (P = 0.06), and granulation tissue on the tympanic membrane/middle ear mucosa (P = 0.3) did not have a significant correlation with ossicular discontinuity [Table 1] and [Table 2]. The audiometric measures like PTA, ABG showed following results [Table 3]. The mean PTA was 46.2 ± 20.1 db in patients with intact ossicular chain, while it was 65.7 ± 14 db in patients with ossicular discontinuity. The mean difference in PTAs was statistically significant (P = 0.04). Similarly the mean ABG was 23.9 ± 9.8 db in patients with intact ossicular chain, while it was 35.1 ± 10.3 db in those with ossicular discontinuity and the mean difference was statistically significant (P = 0.001). A prospective study of 47 patients with tubotympanic type of CSOM was conducted and majority of them were females, that is, 66%. Most common age group affected was between 10 and 30 years. The study showed that with increase in duration of symptoms there was significant chance for ossicular discontinuity. Sadé  has reported that ossicular discontinuity is more common among older age groups and increases with the duration of the disease. In our study, it was observed that incus was the most common ossicle to get eroded followed by stapes. Similar findings have been reported in many other studies. ,, Although the incus is not as delicate as stapes or as exposed as malleus to external environment and infection, it is the most vulnerable ossicle for erosion. This has been attributed to its position and the course of its blood supply. The lenticular process of the incus receives its blood supply through the submucosal vessels that come from the body of the incus and from the stapes via the crura and stapedial tendon. The blood vessels, therefore, have a long course to reach the lenticular process and any compromise in this precarious circulation either due to infection or due to cholesteatoma, may result in avascular necrosis of lenticular process and subsequent loss of ossicular continuity. The other proposed causes of ossicular erosion are hyperemia with mucosal inflammation, granulation tissue formation, or pressure on the bones due to cholesteatoma, and so on. , Our study showed that increased possibility of ossicular erosion would occur if the margins of perforation were adherent to promontory (P = 0.003). Similar observation has been reported by another study and have concluded that adhesion causes confinement of inflammatory products and granulation tissue to a small blind sac causing hyperemia and increased pressure on ossicles leading to erosion. Preoperative evaluation of audiometric parameters included PTA and ABG. There was significant difference between ossicular defects and intact ossicles with respect to pure tone audiometry and ABG scores (P = 0.001). Similar observations were made by other studies which suggests that PTA and ABG are good indicators of ossicular defects in tubotympanic type of CSOM. , The same might not be true in case of cholesteatoma because the hearing mechanism may be preserved, either by the bridging mechanism or by retraction of tympanic membrane onto stapes head. , There was no significant association with respect to other parameters like myringosclerosis, polypoid middle ear mucosa on ossicular status. From the study, it can be concluded that in tubotympanic type of CSOM, the risk of ossicular discontinuity is higher if, the disease persists for a longer duration and if the margin of the perforation is adherent to the promontory. A PTA of about 65.65 ± 13.92 db and an ABG of 35.1 ± 10.3 db or more on PTA is also suggestive of ossicular discontinuity. Other parameters like age, persistent discharge, size of the perforation, myringoscerosis, polypoid middle ear mucosa, mastoid pneumatization, and PTA were not found to be reliable in predicting ossicular defects. However, authors strongly feel that a larger study is required to validate the predictive ability of the parameters. 1. Sadé J. Ossicular changes in chronic middle ear inflammation. Acta Otolaryngol 1980;92:277-82. 2. Meyerhoff WL, Kim CS, Paparella MM. Pathology of chronic otitis media. Ann Otol Rhinol Laryngol 1978;87:749-60. 3. Thomsen J, Bretlau P, Balslev Jøorgensen M. Bone resorption in chronic otitis media. The role of cholesteatoma, a must or an adjunct? Clin Otolaryngol Allied Sci 1981;6:179-86. 4. Tos M. Pathology of the ossicular chain in various chronic middle ear diseases. J Laryngol Otol 1979;93:769-80. 5. Pennington CL. Incus interposition techniques. Ann Otol Rhinol Laryngol 1973;82:518-31. 6. Abramson M, Moriyama H, Huang CC. Pathogenic factors in bone resorption in cholesteatoma. Acta Otolaryngol 1984;97:437-42. 7. Chole RA, Choo NJ. Chronic otitis media, mastoiditis and petrositis. In: Cummings CW, editor. Otolaryngology head and neck surgery. 3 rd ed., Vol. 4. St Louis: CV Mosby; 1998. p. 3026-46. 8. Jeng FC, Tsai MH, Brown CJ. Relationship of preoperative findings and ossicular discontinuity in chronic otitis media. Otol Neurotol 2003;24:29-32. 9. Durko M. Air-bone gap and hearing impairment level predictive value in preoperative assessment of cholesteatoma localization in the tympanic cavity. Otolaryngol Pol 2004;58:73-7. 10. Youngs R. Chronic suppurative otitis media, Cholesteatoma. In: Ludmann H, editor. Disease of Ear. 6 th ed. London: Arnold; 1998. p. 386-97. 11. Mills RP. Management of chronic suppurative otitis media. In: Booth JB, editor. Scott Brown′s Otolaryngology. 6 th ed., Vol 3. London: Butterworths; 1997. p. 10/1-10 /.